Zach Charbonnet of Oaks Christian (Westlake Village) gained one of four first team all-state slots at running back while Folsom’s Kaiden Bennett had to be first team in multi-purpose category for his passing and rushing totals. Photos: Twitter.com & folsomtelegraph.com. We’re excited two days after Super Bowl Sunday and just before the February letter of intent signing day to present these 11 players plus a kicker and three of six multi-purpose players that have been selected to headline the 40th annual 2018 Cal-Hi Sports All-State Football Teams. This is the elite group without school size or year in school limitations. For this year, we went with only one receiver with four running backs and that receiver ended up being Mr. Football State Player of the Year Bru McCoy of Santa Ana Mater Dei. The Monarchs don’t have five first team all-state players this year like last year, but both they and arch-rival St. John Bosco have three. For this year’s Second & Third Team (Gold Club post), CLICK HERE. If you are not a Gold Club member and want to see the already announced All-State Junior & Sophomore Teams plus many, new updated state record files and more exclusive content, please sign up today. You can now join for one-month rate of just $3.99. For subscription info, CLICK HERE. FOR ARCHIVE OF ALL-TIME ALL-STATE TEAMS BACK TO THE 1970s, CLICK HERE. To order a commemorative, official All-State Football patch for those who’ve been named to one of our all-state teams for the 2018 season, go to this link from our friends at Billy Tees, which has been the official merchandiser of the CIF for many years. WR Bru McCoy (Mater Dei, Santa Ana) 6-3, 215, Sr. Although Bru’s selection for this team was expected, it was likely assumed by most he’d be in the multi-purpose category due to the additional contributions he made for the Monarchs on defense. But there was an abundance of dual-threat quarterbacks we felt had to be on for multi-purpose this year, and Bru’s accomplishments as a receiver in an of itself were plentiful. The big athlete was a key cog in Mater Dei winning its second consecutive CIF State Open Championship and a share of the national championship once again. In 14 games, McCoy caught 78 passes for 1,428 yards (18.3 average) and 18 touchdowns. Opposing defenses shuttered at having to cover this dominant athlete. The two-way standout showed flashes of what kind of player he was in the Monarchs big 42-0 win over Bishop Gorman (Las Vegas) early in the season. McCoy caught a touchdown pass and had two sacks on defense. Midway through the season, he concentrated on just offense, but still finished with five sacks. As a receiver, McCoy utilizes his size to gain position on usually smaller defensive backs. He also has the keen knack to find a seam on his routes and get open for his quarterback. As an outside pass rusher, he has drawn comparisons to Anthony Barr and Von Miller. Regardless of where he is situated on the field, McCoy has big play ability. With his big season, McCoy’s final number put him in the top-three in Monarch history in the key receiving categories: pass receptions, receiving yards and touchdowns scored. After enrolling briefly at USC, McCoy has transferred to Texas where he looks to play for the Longhorns this fall. OL Josh Carlin (Sierra Canyon, Chatsworth) 6-6, 295, Sr.
A couple of the offensive line positions for this year’s first team were very difficult to choose and one of the reasons that Carlin got one of them is that he also represents Sierra Canyon’s only first team honoree. It was a squad that went to the CIF Division 1-A state championship that lost a fourth quarter lead in a defeat at the hands of Brentwood Liberty. Having seen Carlin play in person twice also is a difference because he has all of the attributes to be a top-level offensive lineman in college. He was actively recruited by several D1 colleges and in December signed with UCLA. The Bruins may move him from the tackle position and develop him as a guard or center. Sataoa Laumea has been one of the top offensive linemen in Southern California for the last two seasons and in addition to collecting a scholarship from the University of Utah also was considering going the Ivy League route due to his academics. Photo: ksl.com. OL Sataoa Laumea (Eisenhower, Rialto) 6-4, 305, Sr.
A preseason all-state first choice who ends the season in the same place, Laumea was a rock all season for an Eagles’ team that was 14-0, defeated Highland of Palmdale in a matchup of 13-0 teams in the CIFSS Division 9 championship, but then lost to Kaiser of Fontana in the SoCal regional bowls. We’ve obviously had many of Sataoa’s heritage on all-state teams, but don’t recall too many with offers from Harvard and Yale in addition to many of the big colleges, such as USC, UCLA, Notre Dame, Nebraska and Oregon. He eventually settled on Utah. He’s one big guy who can stand out with books, tests and homework right along with sleds, rope ladders and one-on-one blocking. Laumea should bring much offensive line versatility to Salt Lake City since he could be developed at any of the five positions. When Rodriguez was selected to last year’s all-state team for juniors, we noticed his size obviously and some of the other honors he received after a great season. Oak Hills and Hesperia can be somewhat off the normal path for college recruiters, however, and it’s not in the top divisions of the CIFSS. Jason proceeded over the spring and early summer at camps and combines to show he was not only legit to be on the all-state junior team, but that he was among the best in the nation. He had offers quickly from a group that included Colorado, Arizona State, UCLA, USC, Florida, Notre Dame and Washington. Rodriguez committed to the Trojans and already is signed and delivered. OL Sean Rhyan (San Juan Hills, SJ Capistrano) 6-5, 300, Sr.
You don’t often see an offensive lineman gaining notoriety as an offensive most valuable player. But that is exactly what big Sean Rhyan achieved for San Juan Hills as he was recognized as Co-MVP of the Sea View League for 2018. The UCLA commit racked up scholarship offers from the Southeastern Conference to the Pac-12. Alabama, Notre Dame and USC were just a few that fell short in gaining his services. Rhyan holds the distinction of being the Bruins’ highest ranked recruit so far in the class of 2019. Overall, he is ranked as the No. 9 offensive tackle in the nation, according to 247 Sports. Rhyan helped San Juan Hills (8-4) capture the Sea View League title and reach the second round of the CIFSS Division 2 playoffs. In addition to his size, Rhyan is blessed with a 6-foot-7 wing span and a hand span of 11 inches. He also owns a 34-inch vertical leap and runs the 40-yard dash in 5.4 seconds. Rhyan developed into a highly-ranked collegiate football prospect with the help of playing rugby in his youth. In fact, it was his primary sport and he was nationally-recognized part of the U.S. Olympic team pipeline. Rhyan also has played baseball, loves to surf and is the top shot put thrower on the Stallions’ track and field team. OL Jonah Tauanu’u (Narbonne, Harbor City) 6-6, 310, Sr.
A three-year varsity starter who played 44 games for the Gauchos received the ultimate honor when he was voted the Marine League “Player of the Year” and L.A. City Section Player of the Year. Not bad for an offensive lineman. That is how dominant Tauanu’u was versus Narbonne opponents from his tackle position. In addition, Tauanu’u was named the “Offensive Player of the Year” by the Daily Breeze, a regional newspaper covering the coastal area where the ‘Bonne is located. The Oregon commit helped the Gauchos win their fifth consecutive L.A. City championship. In his career, Tauanu’u and Narbonne also won 36 games, a better than 80 percent clip. In 2018, Tauanu’u’s blocking helped the Gauchos offense gain nearly 3,000 yards rushing and over 3,500 yards passing while scoring 68 touchdowns. D.J. Uigalelei was the front-runner to be Mr. Football State Player of the Year until the CIF Southern Section Division I championship and no doubt will be itching to get back to that point of the season again as a senior. Photo: Mark Tennis. QB D.J. Uigalelei (St. John Bosco, Bellflower) 6-5, 240, Jr. He is likely be the No. 1 recruit (pro-style QB) in the Class of 2020 for the nation and goes onto this year’s first team as the quarterback and not for multi-purpose. D.J. has attracted attention of recruiters since he was a freshman. In the summer between his freshman and sophomore years, Uiagalelei demonstrated the strength of his throwing arm with an 80-yard toss. Since then, he has impressed anyone who has seen him play. He led St. John Bosco to a 13-1 mark and at times, a No. 1 ranking in the national polls. A loss to mighty mater Dei ended the drive for a state title. In 14 games, Uiagalelei was 179-of-257 (69.6%) passing for 3,366 yards and threw 48 touchdowns (just 7 interceptions). He also added six touchdowns on the ground. He garnered several of the major state and national awards. Uiagalelei was named Gatorade State Player of the Year and USA Today’s “Offensive Player of the Year. He wasn’t Mr. Football for the state, but did earn State Junior Player of Year honors in what ended up being a close call with Mater Dei’s Bryce Young. Uiagalelei has impressed with his pristine touch on throws, reaching into tight windows between defenders. He hits open men downfield with ease. In addition, he is a master at spreading the wealth as three of his receivers finished with exactly 64 receptions and more than 800 yards receiving each. RB Zach Charbonnet (Oaks Christian, Westlake Village) 6-2, 215, Sr. The offensive workhorse for Oaks Christian, Zach helped the Lions to a stellar season, finishing 12-1. The senior back gained 1,770 yards rushing on 215 attempts (8.2 average), averaged 160.9 yards per game and scored 13 touchdowns. Tireless, Charbonnet played on defense as well and contributed three interceptions. A picture of consistency, in nine of the 11 games this season, Charbonnet rushed for more than 100 yards. Many came at the expense of top-tier opponents. This included 255 against Calabasas, 176 and 143 yards in two games versus Chaminade, as well as 224 yards against Murrieta Valley. His most impressive effort, 221 yards, may have come against JSerra Catholic from the Trinity League. In the playoffs against St. John Bosco, he had an interception and scored the Lions’ only touchdown on a 58-yard run. Charbonnet is headed to Michigan to play for head coach Jim Harbaugh. For his efforts, Charbonnet was selected as “Back of the Year” by the Los Angeles Times. RB Christian Hunter (Kaiser, Fontana) 6-0, 190, Sr. Sometimes, a player just did so much during the season that there’s just no way to deny him a first team all-state nod. Hunter was that type of player for the Kats. He didn’t just lead the state in rushing, but he did it by a wide margin and will go into the state record book with 3,839 yards. That’s fourth on the all-time state list. Hunter didn’t do that at the highest levels of competition, but it’s not small school, either. And he was a force in every game, including 204 yards when Kaiser lost to Wilcox of Santa Clara in the CIF D3-A state final. In the CIF SoCal D3-A bowl game, Christian went bonkers with 324 yards rushing and seven touchdowns in a win over previously unbeaten Eisenhower of Rialto. He also had four other 300-yard outbursts and he also finished with 58 total touchdowns scored. That’s also fourth highest in California history and set a new record for the Inland Empire. Many all-state players over the 40 years of the honors are included in our book that has been called a must-read for anyone interested in high school football. 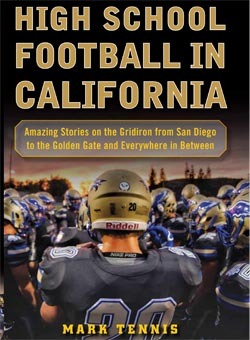 Fans in Brentwood/Antioch/Pittsburg can get a signed copy on Sunday, Feb. 10 between 1 and 3:30 pm at the Brentwood/Antioch Barnes & Noble. Order it online now by CLICKING HERE. RB Austin Jones (Bishop O’Dowd, Oakland) 5-11, 190, Sr. There was a debate on Twitter early in the season whether Jones or Oaks Christian’s Zach Charbonnet was the best running back in the state. We’d add Jordan Wilmore (see below) into that mix and can’t ignore the all-time great season by Christian Hunter (see above) and we’re glad for now that we didn’t have to answer that question and simply picked all four. Jones also had a stellar enough season that the San Francisco Chronicle chose him to be its All-Metro Player of the Year. That was ahead of De La Salle’s Henry To’oto’o (who was a Mr. Football State POY finalist while Jones was not), but Austin is nonetheless a legit pick for that honor as well. He had 2,005 yards rushing and 24 TDs for a Dragons’ team that won the CIF North Coast Section D2 title but couldn’t go on to the state bowls due to cancelled playoff weeks in the NCS for too much fire-related smoke in the air. Jones had 100 yards in every game and had 213 in a regular season loss to De La Salle. For his career, Austin also ranks among NorCal’s best ever with 6,902 yards rushing and 93 total touchdowns. He runs with physicality that is hard to match (check out his stiff arm on YouTube during one TD run in his last game) and that is exactly the sort of back who has excelled in recent years at Stanford. Guess where Jones is going for college? RB Jordan Wilmore (Lawndale) 5-9, 200, Sr. The senior back led Lawndale to a 14-2 overall record and the CIF Division 2-A state championship. He had 220 yards on 29 carries and two TDs in the title game vs. San Joaquin Memorial of Fresno and already has been chosen as the Cal-Hi Sports Medium Schools State Player of the Year. One of the most consistent running backs in the country over his three-year varsity career, Wilmore gained more than 2,200 yards rushing each year. He notched 2,289 as sophomore, 2,220 as a junior and 2,236 as a senior. That equates to an impressive average of 177.5 yards per game. Steady as you will find, Wilmore rushed for at least 100 yards in 32 of his 38 career varsity games. He also finished with 77 rushing touchdowns over three seasons, 22 as a senior. In his best year, his junior season, he averaged 12.3 yards per carry and had 36 total touchdowns, including one kickoff and one punt return. Wilmore has offers from nineteen programs on the table, per 247 Sports, including eight from Pac-12 schools. Originally committed to USC, Jordan pulled back in mid-January to reassess his options. PK Colton Theaker (Arroyo Grande) 6-3, 180, Sr. Selecting kickers is literally a different process than for any other positions. Yes, stats are checked out closely but not every team puts in stats into MaxPreps, not every newspaper all-star team puts stats by its players and not that many coaches nominate kickers. It’s also harder for a top kicker from elite teams that already can have two, three or four players on an all-state team to get the kicker written up as well. We also admit to looking to see who has 5.0 or 4.5 or 4.0 stars on the Chris Sailer Kicking rankings. Which brings us to Colton. He is shown with 5.0 ranking on that site (one of the highest in the nation) and he had a top-notch season at Arroyo Grande. Theaker was perfect on PATs (45 of 45), crushed 55 of 66 kickoffs into the end zone and he made 10 of 15 on field goals with one of the longest field goals this year in the state (52 yards). For his career, Theaker went 23 of 32 on field goals. He is staying close to home for college and will kick next at Cal Poly San Luis Obispo. Akili Arnold of Mission Viejo had a sensational season on both sides of the ball. Photo: Hudl.com. RB/WR/DB Akili Arnold (Mission Viejo) 6-1, 190, Sr.
QB/RB Kaiden Bennett (Folsom) 6-0, 175, Sr. The Sacramento Bee All-Metro Player of the Year and a Mr. Football finalist has to get tons of credit for starring in back-to-back CIF Division 1-AA state championship wins for the Bulldogs. This season, he passed for 261 yards and two touchdowns and rushed for 137 yards and one score in the team’s overtime triumph vs. Cathedral Catholic of San Diego. For the season, Bennett piled up 4,254 yards passing with 62 TDs and rushed for 568 yards plus 13 scores. He’ll also go into the state record books with 11,049 career passing yards. Bennett, who already is enrolled and attending classes for the spring semester at Boise State, also will be remembered for only throwing five interceptions during his senior season. QB/RB Jayden Daniels (Cajon, San Bernardino) 6-3, 190, Sr. When all was said and done, Daniels has been one of the most prolific passers in state history and unequaled for rushing-passing total offense. A four-year varsity starter at Cajon, Daniels compiled a 44-10 record including back-to-back seasons with at least 12 wins. He threw for CIF Southern Section records 14,007 yards and 170 touchdowns during a historic four-year career. In addition, he added 3,645 rushing yards and 41 rushing touchdowns showing off his unique athleticism. As a senior, he led Cajon to a 12-2 record and a spot in the CIFSS D3 championship. From a scouting standpoint, recruiters liked his dual-threat ability. Daniels demonstrated the ability to make precise throws to any part of the field with advanced pocket awareness for a prospect at his age. A finalist for Mr. Football in the state, Jayden has enrolled early at Arizona State, arriving on campus in January, to be eligible to participate in spring practice. Still the best in the entire country. Thanks Mark for another informative season. Love your book.